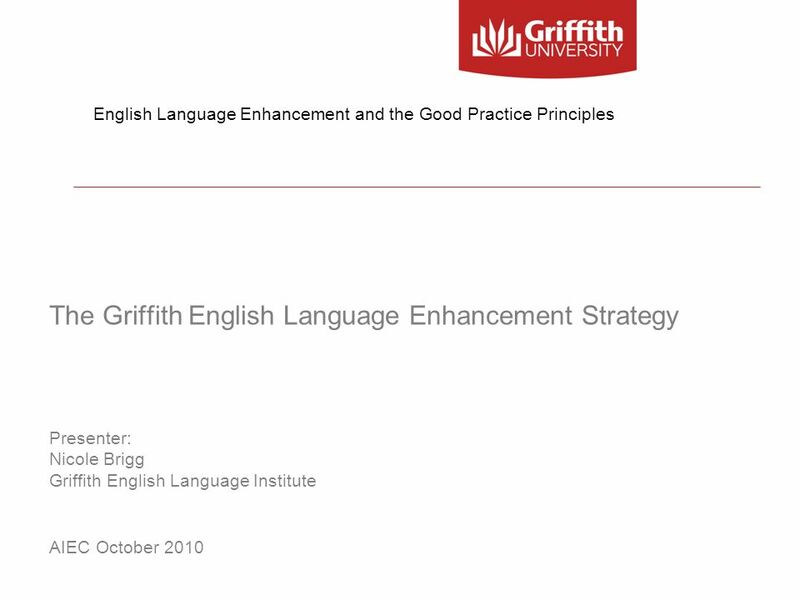 The Griffith English Language Enhancement Strategy Presenter: Nicole Brigg Griffith English Language Institute AIEC October 2010 We’d like to share with you today information on a course at GU called ELEC, which is in its very first semester of delivery. This course is credit-bearing, embedded and discipline-specific. 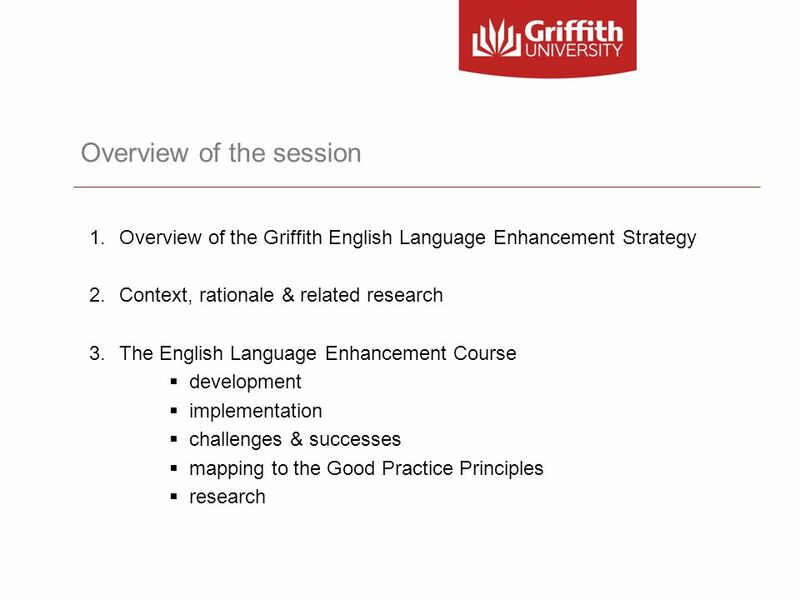 Overview of the Griffith English Language Enhancement Strategy Context, rationale & related research The English Language Enhancement Course development implementation challenges & successes mapping to the Good Practice Principles research The ELEC is in fact just one component of a much broader strategy called the GELES and first we’ll provide an overview of the whole strategy. Then we aim to briefly summarise the context which provided the rationale for the development of the GELES, mentioning some recent research related to discipline-specific courses. Ian Johnson will then go on to focus on the ELEC describing its development, implementation, some of the challenges & successes we’ve experienced in this first semester of delivery and finally I’ll provide an overview of the research currently underway to evaluate it. 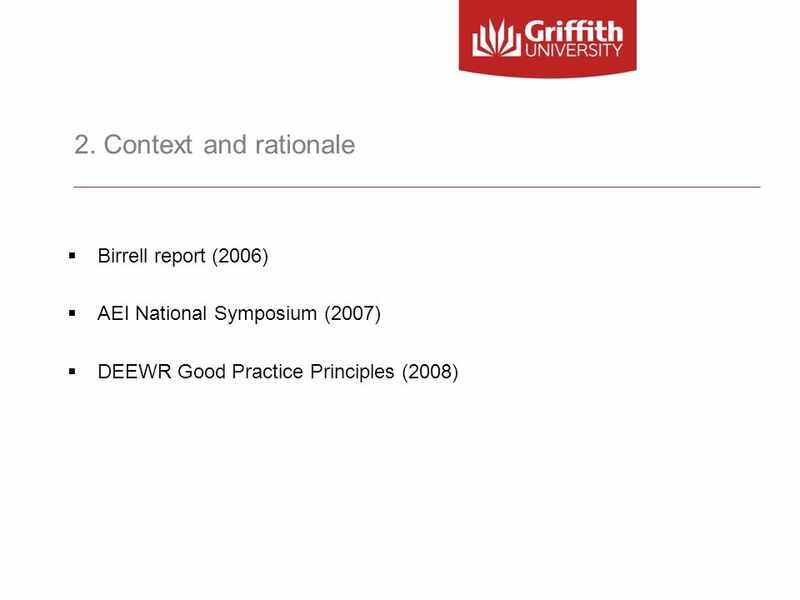 AEI National Symposium (2007) DEEWR Good Practice Principles (2008) Having looked at what the GELES is, we wanted to briefly provide a context and rationale for the creation of the GELES. 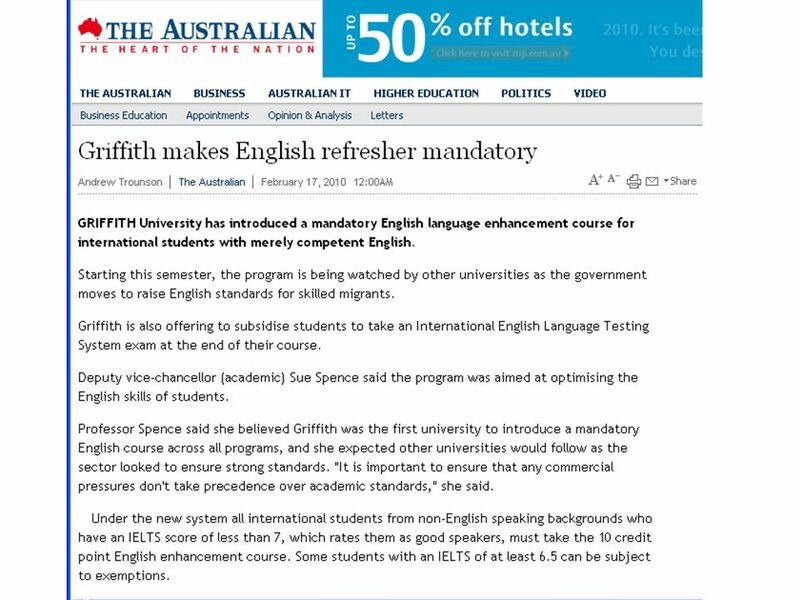 This audience would be well aware of the scrutiny that the English language levels of international students in Australian universities has come under in the last few years. 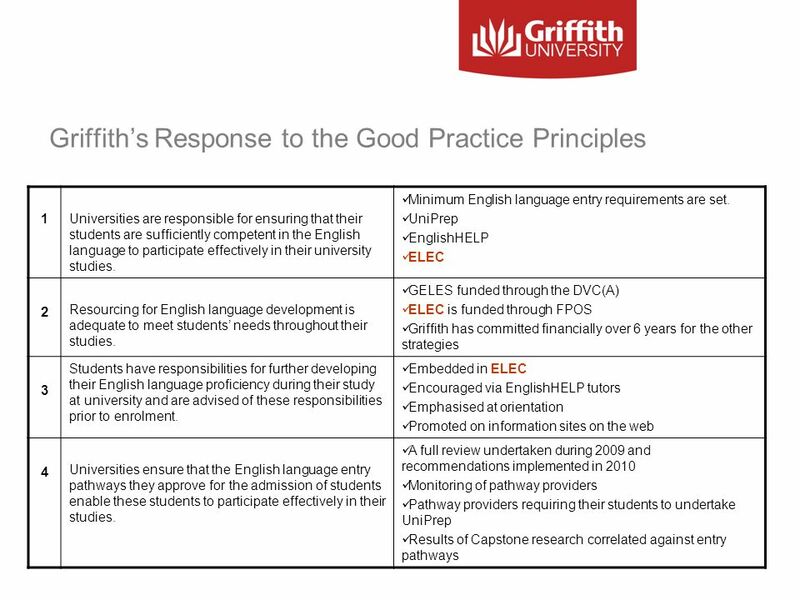 The catalyst for much of the debate was arguably the so-called Birrell report published in 2006 which raised concerns over the alleged language standards of international students both at entry to and exit from Australian tertiary institutions. Youa re probably also aware of the National Symposium organised by Australian Education International to focus on the English language competence of international students in In a set of good practice principles were commissioned by DEEWR to guide universities in supporting international students. 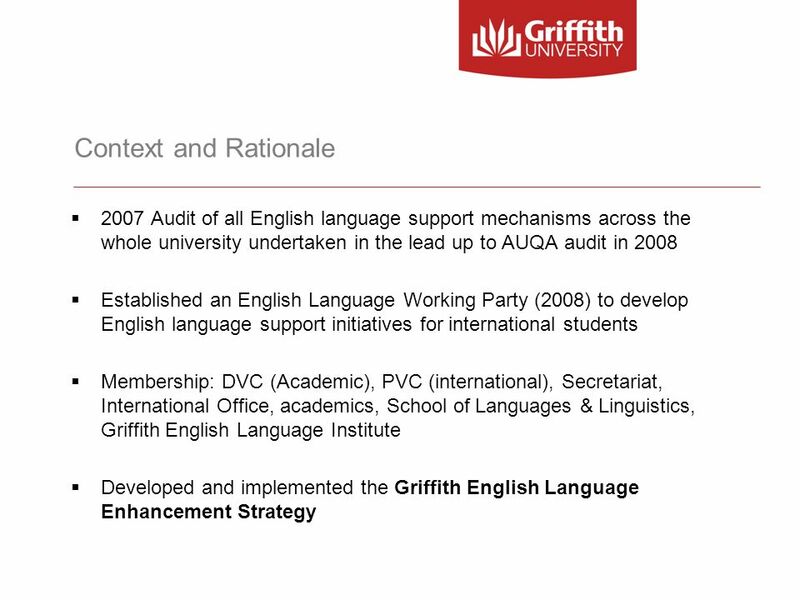 5 Context and Rationale 2007 Audit of all English language support mechanisms across the whole university undertaken in the lead up to AUQA audit in 2008 Established an English Language Working Party (2008) to develop English language support initiatives for international students Membership: DVC (Academic), PVC (international), Secretariat, International Office, academics, School of Languages & Linguistics, Griffith English Language Institute Developed and implemented the Griffith English Language Enhancement Strategy Prior to the AUQA visit at GU in 2008, an audit of all EL support mechanisms was conducted. There were a number across the uni though they tended to be faculty-specific rather than centrally and systematically. The decision was taken to establish an ELWP to identify gaps and to develop appropriate support initiatives in a more systematic manner. From the membership of the ELWP it can be seen that this strategy is driven from the highest level within university and involves all key stakeholders. It has taken great leadership from the DVC to implement this wide-ranging and pioneering initiative. What is also interesting is that GELI is front and centre in this strategy, having responsibility for all strands of the GELES in some capacity, which underlines the key role that GELI now plays in the university proper and, in our view, is testament to the changing perception of ELT specialists in the tertiary sector where content has been dominant and EL has traditionally been afforded much less weight. Over the last 18 months, the ELWP has developed and implemented the GELES. 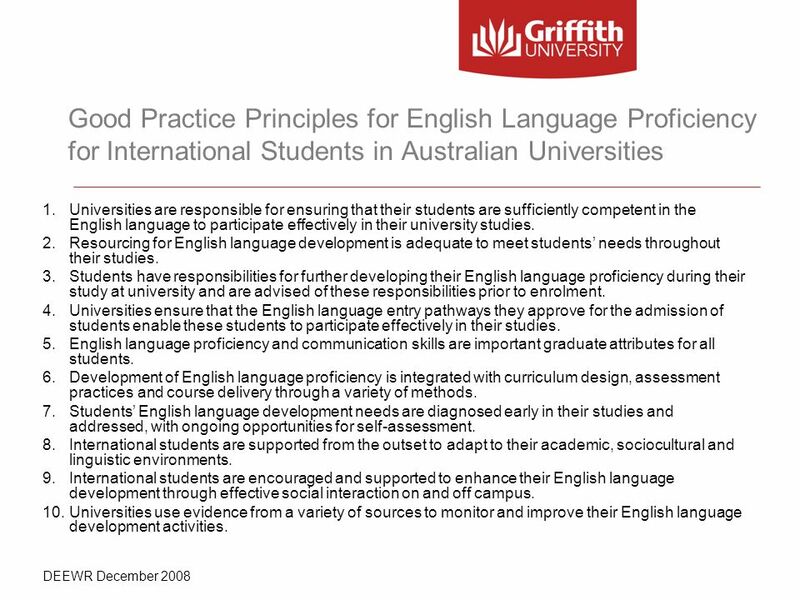 6 Good Practice Principles for English Language Proficiency for International Students in Australian Universities Universities are responsible for ensuring that their students are sufficiently competent in the English language to participate effectively in their university studies. Resourcing for English language development is adequate to meet students’ needs throughout their studies. 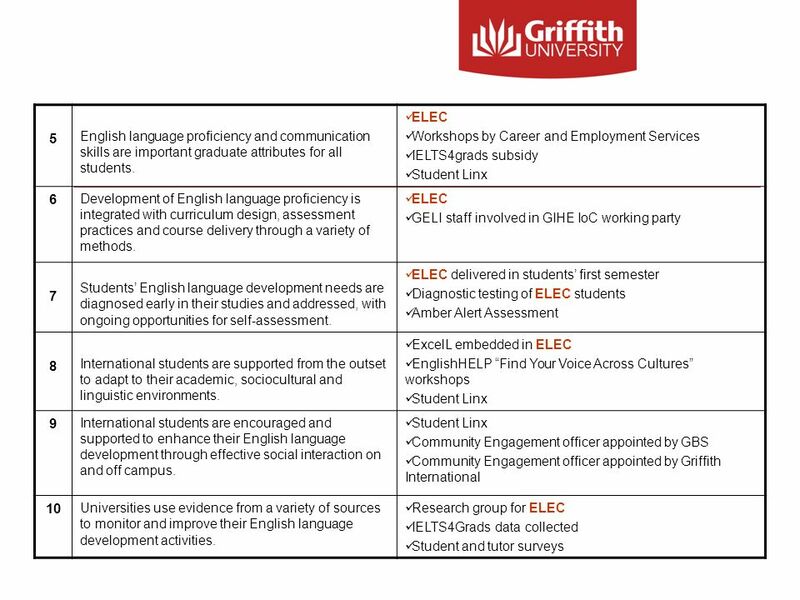 Students have responsibilities for further developing their English language proficiency during their study at university and are advised of these responsibilities prior to enrolment. 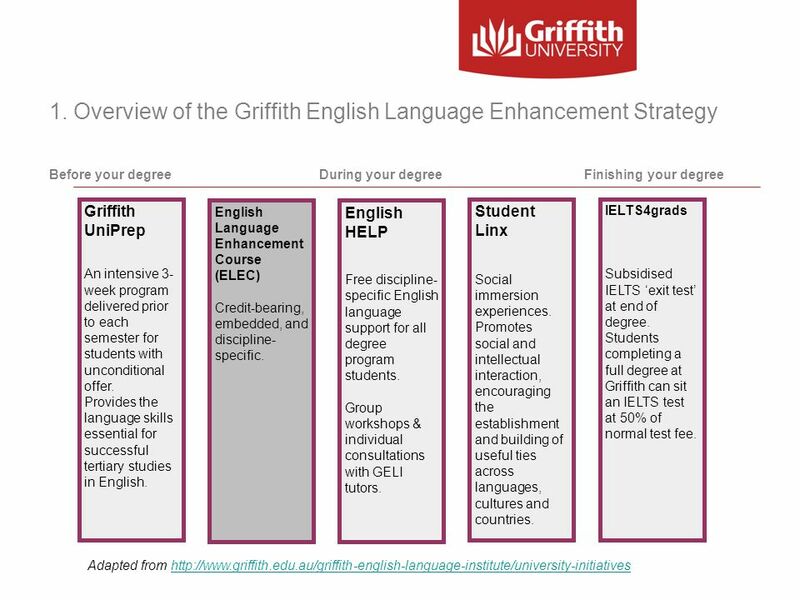 Universities ensure that the English language entry pathways they approve for the admission of students enable these students to participate effectively in their studies. English language proficiency and communication skills are important graduate attributes for all students. Development of English language proficiency is integrated with curriculum design, assessment practices and course delivery through a variety of methods. Students’ English language development needs are diagnosed early in their studies and addressed, with ongoing opportunities for self-assessment. International students are supported from the outset to adapt to their academic, sociocultural and linguistic environments. International students are encouraged and supported to enhance their English language development through effective social interaction on and off campus. 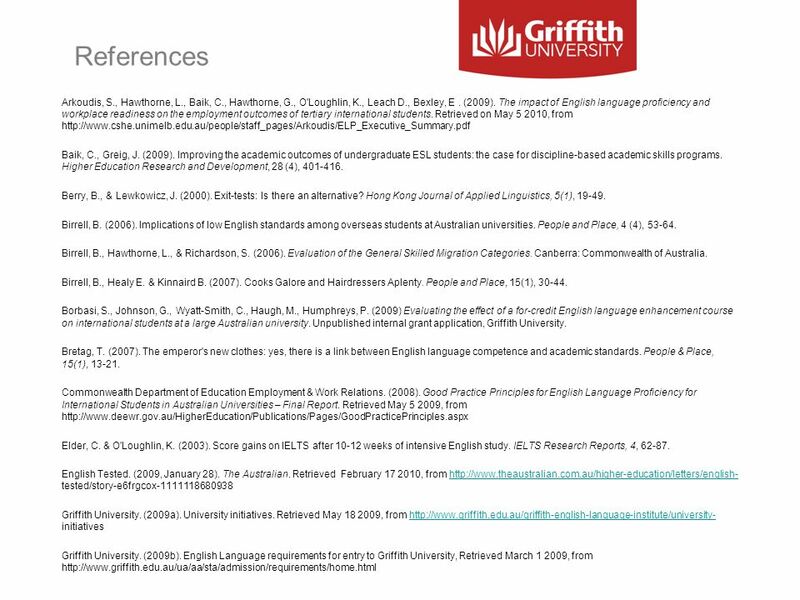 Universities use evidence from a variety of sources to monitor and improve their English language development activities. DEEWR December 2008 Representatives from the Griffith ELWP attended the final workshop to fine-tuning the GPPs, in Melbourne in November But in fact Griffith was already well on the way to being able to demonstrate compliance with each of these principles and simply needed to map GELES against the GPPs to ensure coverage. 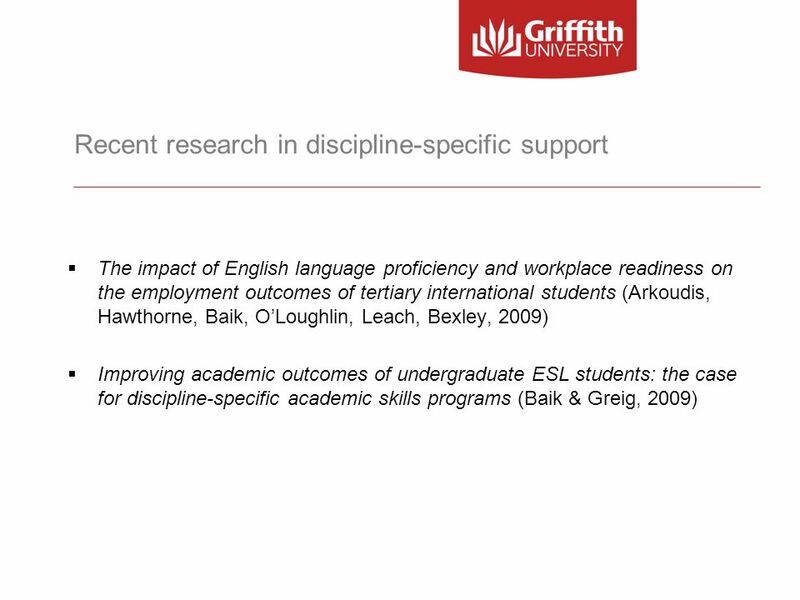 The impact of English language proficiency and workplace readiness on the employment outcomes of tertiary international students (Arkoudis, Hawthorne, Baik, O’Loughlin, Leach, Bexley, 2009) Improving academic outcomes of undergraduate ESL students: the case for discipline-specific academic skills programs (Baik & Greig, 2009) For those interested in the research related to these issues, the full reference list appears at the end of the presentation but there are two recent articles I’d like to draw your attention to. The first one, commissioned by DEEWR and published in 2009 by Arkoudis et al, made 6 recommendations some of which directly support the embedding of discipline-specific courses in order to enhance workplace readiness of ISs. The first recommendation was that universities and VET providers develop a range of targeted programs and resources to support and enhance the development of international students’ ELP during their course of study. Recommendation 2 advised education providers to develop closer links with industry and employer groups regarding employability skills that can be embedded within for-credit curriculum teaching and assessment. 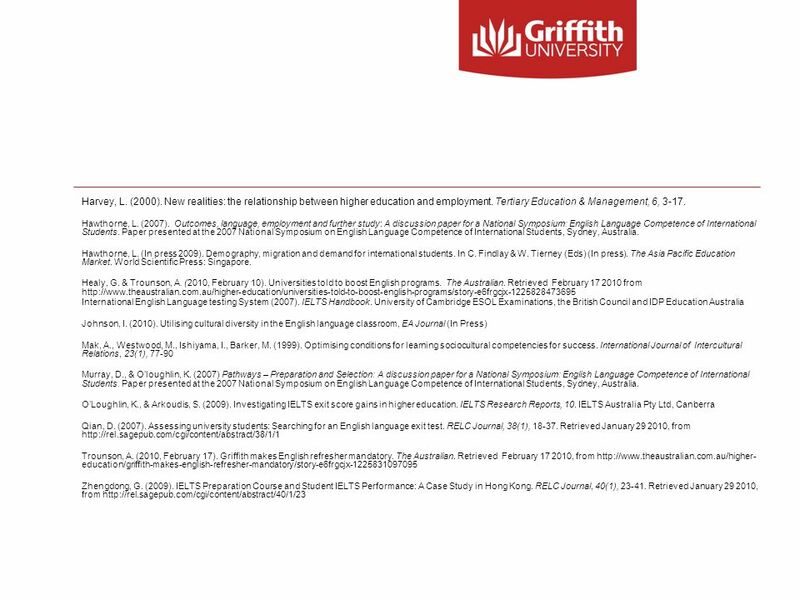 The third recommendation focused on developing language support programs relevant to the workplace. The study highlights the fact that ELP is one key predictor of successful employment. The Baik and Greig paper examines the impact of an adjunct DS course for first year UG architecture students at the Uni of Melbourne. This paper is quite pertinent for anyone considering developing DS embedded courses. They found that students value a highly DS approach to language and academic skills support rather than the generic academic skills support that has traditionally been provided. They found that students were better able to make use of academic skills embedded within the discipline compared to a generic EAP course. They also found that students are motivated to attend programs that are related to their discipline and that regular participation in a content-based ESL program can lead to positive longer-term benefits on ss’ academic outcomes. Other literature in this area also confirms this notion of a ‘transfer climate’ where the course facilitates the transfer of a particular skill and the Baik/Greig paper suggests that this works best within DS content. 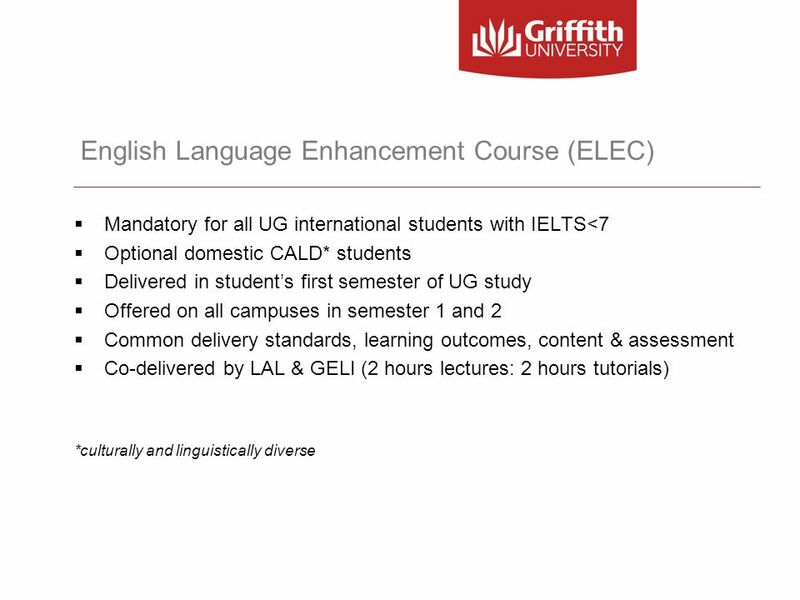 Mandatory for all UG international students with IELTS<7 Optional domestic CALD* students Delivered in student’s first semester of UG study Offered on all campuses in semester 1 and 2 Common delivery standards, learning outcomes, content & assessment Co-delivered by LAL & GELI (2 hours lectures: 2 hours tutorials) *culturally and linguistically diverse In the light of the research, let’s take a look now at the Griffith ELEC. 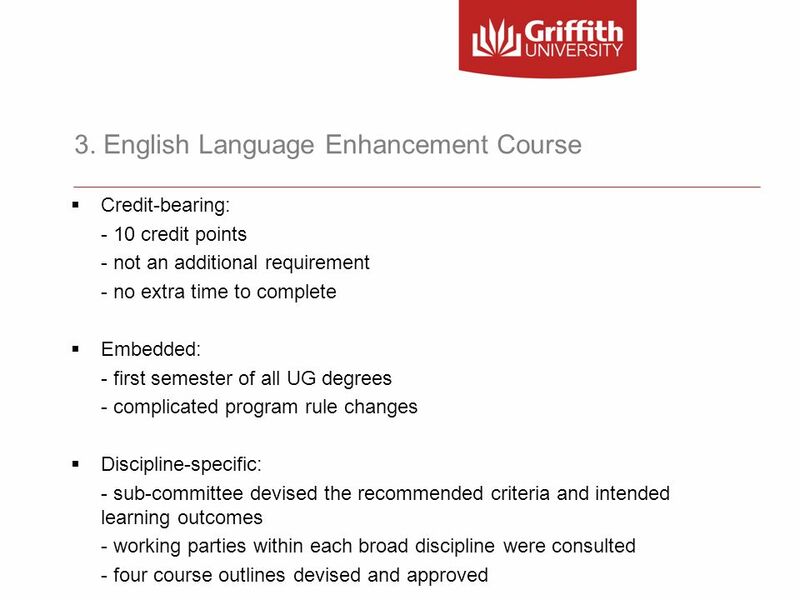 The course is mandatory for all international students whose entry score is less than IELTS 7 (or accepted equivalent) or who meet certain exemption criteria according to Griffith’s admission policies - predominantly LOI. The course is currently optional for CALD. 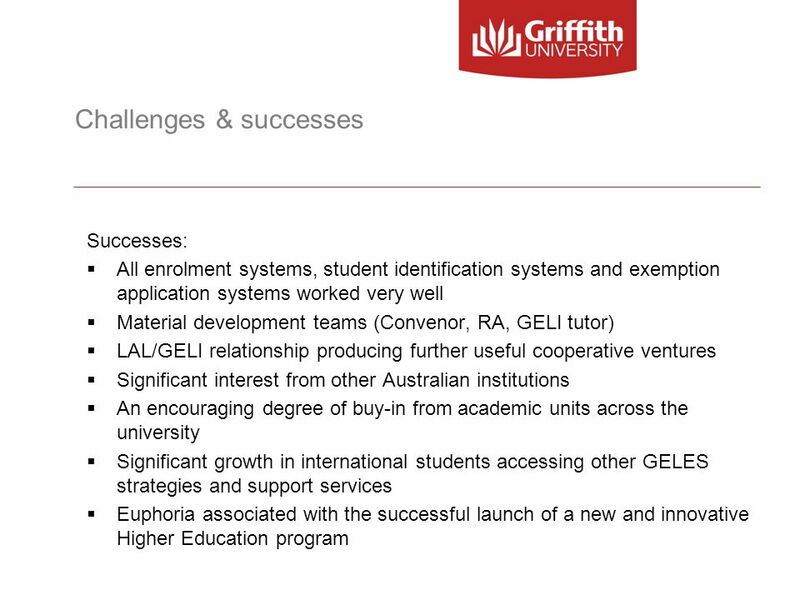 Offered across all five of Griffith’s campuses, it is delivered in the ss’ 1st semester. 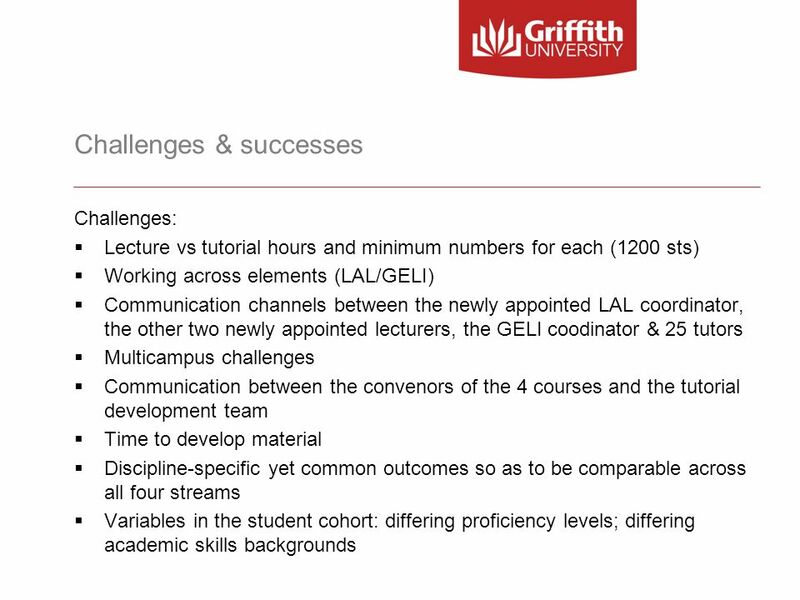 Common standards for comparability across the four programs – Ian will talk more about this later in the presentation The delivery is unique in that it is shared by two elements – LAL and the uni ELI - showing the innovative hybrid nature of the course as a mix of a traditional university subject and an English-language course. As far as we are aware, it is the first such program to be introduced across all UG programs in an Australian university. To develop the communicative competence (grammatical, sociolinguistic, discourse, strategic) in English of students in an academic and specific disciplinary context, including producing, interpreting, analysing and participating in text. Text refers to authentic spoken or written discourse in a particular genre. To raise student awareness of features and expectations of the Australian tertiary system that underpin English language practices in Australian universities as it fits within the broader Australian cultural context. 3. To ensure students are aware of their responsibility to continue to develop their English language skills throughout the course of their degree program. ILO 1 is main linguistic outcome with an emphasis on discipline-specific content and text types. ILO 2 This entails drawing the attention of students different modes of learning (both cooperative/group-work and independent learning) and different assessment practices. ILO 3 this entails drawing attention to other strands of the GELES as well as other support services available to students within the uni. Not de-contextualised grammar or only academic skills but intensive language practice and immersion within the discipline. 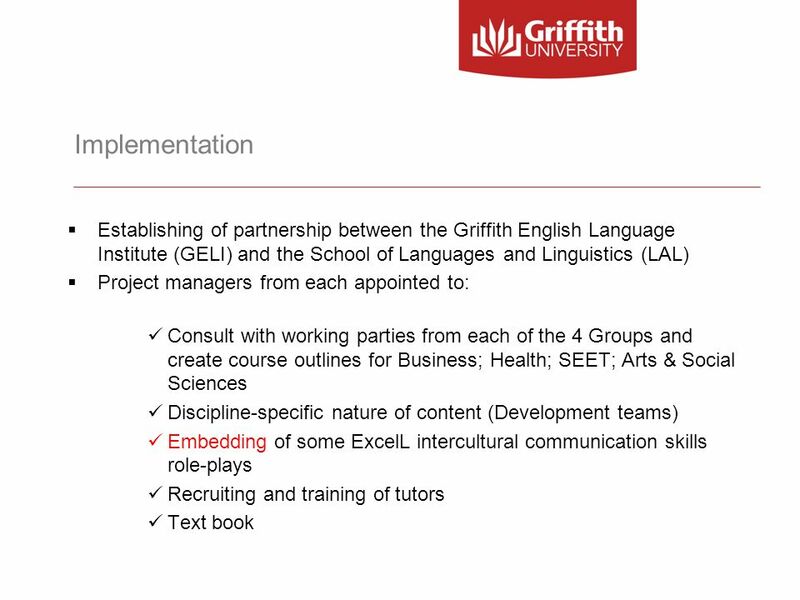 12 Implementation Establishing of partnership between the Griffith English Language Institute (GELI) and the School of Languages and Linguistics (LAL) Project managers from each appointed to: Consult with working parties from each of the 4 Groups and create course outlines for Business; Health; SEET; Arts & Social Sciences Discipline-specific nature of content (Development teams) Embedding of some ExcelL intercultural communication skills role-plays Recruiting and training of tutors Text book ELEC needed to be delivered by an academic unit but GELI was seen to have the expertise in the language teaching area, as well as a reservoir of professional and experienced teachers Furthermore, GELI had experience and expertise in the creation and delivery of its very successful DEP The working parties were made up of academic representatives from each school or faculty within the groups, e.g. Health (Nursing, Pharmacy, Human Services, Psychology, etc) Once the course outlines were established, members of the working parties were asked to locate and forward discipline specific models of text and assessment items The working parties were particularly concerned about international students’ abilities to communicate effectively and appropriately in the university environment and on work placements, hence ExcelL Majority of tutors had discipline-specific quals and experience as well as being NEAS qualified – 25 tutors were required for semester 1 this year (3 lecturers) GELI delivered a Cert IV TESOL for any existing academics/tutors who wished to participate but did not have the TESOL qual required. An all-day, paid induction day held a week prior to commencement. A compilation text book was developed by the project managers through Pearson, so there was a good reference for tutors and students, relating to the main, generic academic and learning skill areas within which the discipline-specific models could be deconstructed and reconstructed. 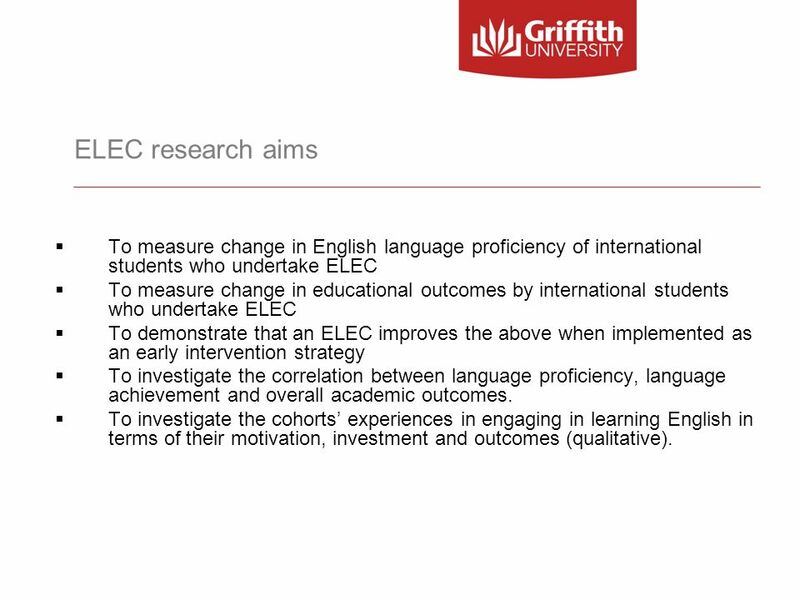 17 ELEC research aims To measure change in English language proficiency of international students who undertake ELEC To measure change in educational outcomes by international students who undertake ELEC To demonstrate that an ELEC improves the above when implemented as an early intervention strategy To investigate the correlation between language proficiency, language achievement and overall academic outcomes. To investigate the cohorts’ experiences in engaging in learning English in terms of their motivation, investment and outcomes (qualitative). Little research currently exists DS ELEC due to the innovative nature of this hybrid between a traditional EAP course and academic subject. In many ways we have outpaced pedagogic understanding on the impact of DS courses Qualitative and quantitative research is being conducted into the impact of the ELEC using IELTS for the quantitative component and focus groups for qualitative. As you can see from the aims on the screen we are investigating proficiency gains as well as correlating any such gains against GPAs. 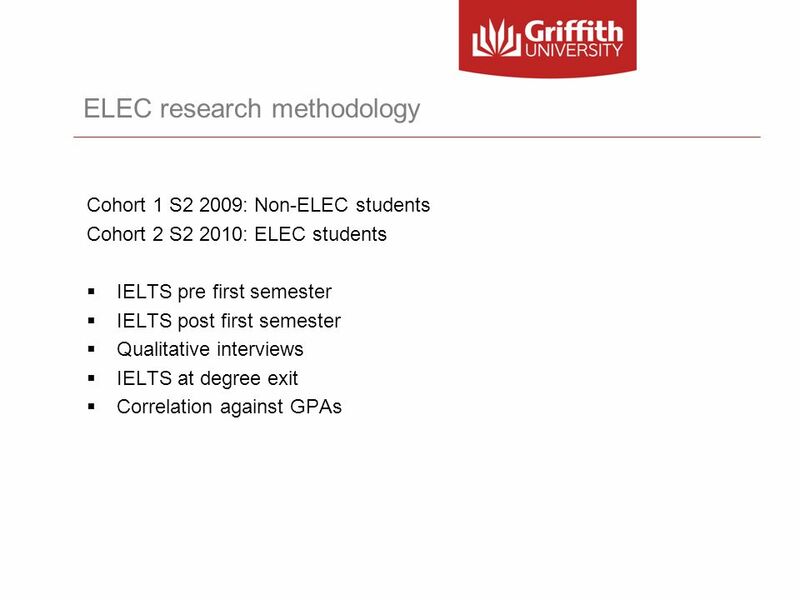 Cohort 1 S2 2009: Non-ELEC students Cohort 2 S2 2010: ELEC students IELTS pre first semester IELTS post first semester Qualitative interviews IELTS at degree exit Correlation against GPAs Cohort 1 who had not taken the ELEC provided the baseline data and took place last year. Cohort 2 are currently being recruited for testing to occur at the same time in This mixed methods approach includes: (Read screen) Thank you – we’d be happy to take questions on ELEC or any other aspect of the GELES later. Download ppt "English Language Enhancement and the Good Practice Principles"
Enhancing Learning: The Aberdeen Approach The Final Report of the Curriculum Commission Bryan MacGregor. Enhancing student learning through assessment: a school-wide approach Christine OLeary & Kiefer Lee Sheffield Business School. Preparing Future Teachers for 21 st Century Learning Partnerships that enhance the capacity of pre-service education 2008 Deakin University Faculty of.